Stepanova E. (ed. ), Humanitarian Challenges, Humanitarian Support and Human Protection in Armed Conflicts (Moscow: IMEMO, 2018), 331 p.
Stepanova E., Russia, chapter 22 in The Oxford Handbook on the Responsibility to Protect, ed. by Alex Bellamy and Tim Dunne (Oxford: Oxford University Press, 2016), pp. 409428. 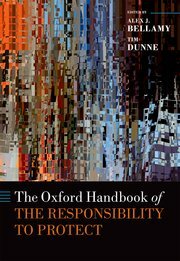 See abstract at Oxford Handbooks Online. Stepanova E. Future trends in violent threats to security, in Global Strategic Developments: A Futuristic Vision (Abu Dhabi: The Emirates Center for Strategic Studies and Research (ECSSR), 2012), pp. 167193; also in Arabic. 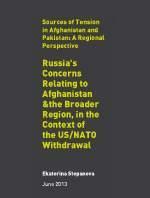 Stepanova E., Russia's Concerns Relating to Afghanistan and the Broader Region in the Context of the US/NATO Withdrawal, (Barcelona: CIDOB, 2013), 23 p.
Stepanova E. The Syrian Civil War: Transition Without Intervention?, PONARS Eurasia Policy Memo no. 228, September 2012; see also in Russian. Stepanova E. Hostage-Taking and Barricade as a Terrorist Tactic, in Terrorism Research and Analysis Consortium (TRAC) e-Encyclopedia, Beacham Publishing Corp., 2012. Stepanova E., Armed conflict, crime and criminal violence, in SIPRI Yearbook 2010: Armaments, Disarmament and International Security (Oxford: Oxford University Press, 2010), pp. 3760; also in Chinese, Russian and Ukranian. Stepanova E., Trends in armed conflicts: One-sided violence against civilians, in SIPRI Yearbook 2009: Armaments, Disarmament and International Security (Oxford: Oxford University Press, 2009), pp. 3968; also in Arabic, Chinese, Russian and Ukrainian. see also » video presentation at SIPRI Yearbook 2009 presentation. Stepanova E., Section V.4. Prevention of and response to emergencies and humanitarian crises, in The Architecture of Euro-Atlantic Security (Moscow: Library of the Institute of Contemporary Development, 2009), pp. 5661, 6364; also in Russian. Stepanova E., Iran and Afghanistan: Cross Border Security Challenges, Conflict Management, and Iran-U.S. Relations, PONARS Eurasia Policy Memo no. 56 (Washington D.C.: Georgetown Univ. Eurasia Strategy Program, May 2009). Stepanova E., Cultures of solidarity and national interest: Russia's conflict management policies, in Jean-Marc Coicaud and Nicholas J. Wheeler (eds. ), National Interest and International Solidarity: Particular and Universal Ethics in International Life (Tokyo: United Nations University (UNU) Press, 2008), pp. 87119. Stepanova E., [The state and the individual in modern conflicts], in Mezhdunarodnyie protsessy [International Processes] vol. 6, no. 1 (Jan.Apr. 2008), pp. 2940, in Russian. Stepanova E., South Ossetia and Abkhazia: Placing the Conflict in Context, SIPRI Policy Brief (Stockholm, November 2008). Stepanova E., [Russias humanitarian potential and post-conflict reconstruction], in Mirovaya ekonomika i mezhdunarodnyie otnoshenija [World Economy and International Relations], no. 5 (May 2007), pp. 6578, in Russian. Stepanova E., Terrorism as a tactics of spoilers in peace processes, in Edward Newmann and Oliver Richards (eds. ), Challenges to Peacebuilding: Managing Spoilers During Conflict Resolution (Tokyo: UNU Press, 2006), pp. 78104. Stepanova E., The use of Russias security forces in post-conflict environment, in Albrecht Schnabel and Hans-Georg Ehrhart (eds. ), Security Sector Reform and Post-Conflict Peace-Building (Tokyo: UNU Press, 2006), pp. 133155. Stepanova E., War and peace building, in The Washington Quarterly (Special Issue: “What Did 9/11 Change?”), vol. 27, no. 4 (Autumn 2004), pp. 127136. 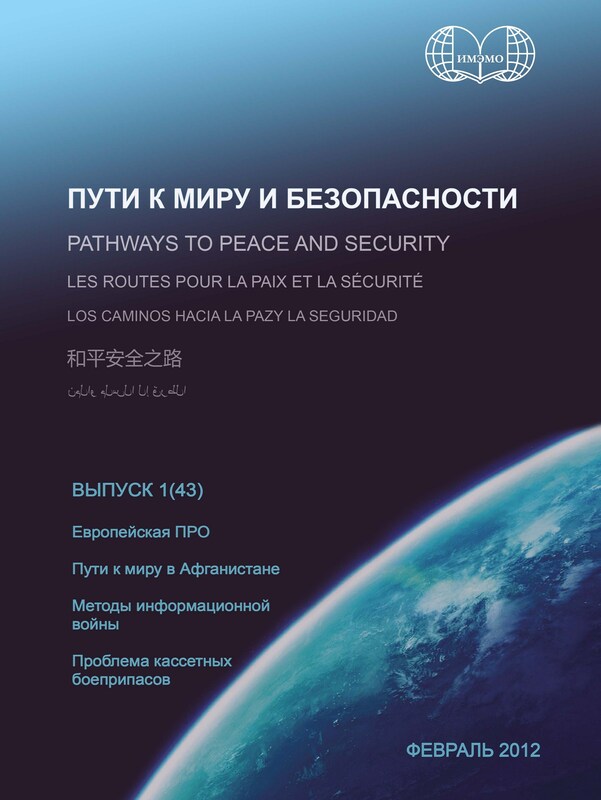 Stepanova E., Linking anti-terrorism and peace operations: specifics and constraints, in Peace Support Operations, Parliaments and Legislation (Moscow: Geneva Center for the Democractic Control of the Armed Forces (DCAF); Center for Political and International Studies (CPIS), 2004), pp. 134141; also in Russian. Stepanova E., International peace-building and radical Islamic organisations in war-torn areas: beyond terrorism, in The Failure of Political Islam, Human Rights Conflict Prevention Center Research Papers [Bihac, Bosnia-Herzegovina], vol. IV, no. 34, 2004, pp. 507527. Reprinted in: Peace Studies: Critical Concepts in Political Science (London: Routledge, 2005), vol. III, pp. 338389. Stepanova E., Post-war Iraq: policy options for Russia, PONARS Policy Memo no. 322, in PONARS Policy Conference Materials, 12 December 2003 (Washington D.C.: CSIS, Nov. 2003), pp. 209215. Stepanova E., [Russia and the problems of local/regional conflict management. Peacekeeping], in Razoruzhenije i bezopasnost [Disarmament and Security, 20012002] (Moscow: Nauka, 2003), pp. 114141, in Russian. Stepanova E., Military operations Other Than War: The U.S. View, in Military Thought [EastView Publications], vol. 11, no. 2 (March/April 2002), pp. 127133. See also in Russian: Stepanova E., [Armed forces' participation in operations other than war], in Voyennaya Mysl' [Military Thought], no. 3 (2002), pp. 7176. Stepanova E., Separately Together: U.S. and Russia’s Approaches to Post-Conflict Settlement in Afghanistan, PONARS Policy Memo no. 230, in PONARS Policy Conference Materials (Washington D.C.: CSIS, 2002), pp. 117122. Stepanova E., The use of Russia’s ‘grey area’ forces in post-conflict environments, in Civil-Military Relations Network Bulletin [King’s College London]. 2002. no 4. pp. 36. Stepanova E., Russia’s policy on the Kosovo crisis: the limits of “cooperative peacemaking”, in K.Spillman and J.Krause, Kosovo: Lessons Learned for International Cooperative Security (Bern: Peter Lang Publ., 2000), pp. 205230; see also in German. Stepanova E., Kosovo and Chechnya: illogical parallels, in Security Dialogue [Oslo: PRIO], vol. 31, no. 1 (March 2000), pp. 507-509.